My first few trips to Paris lap at the borders of my memory. In those nascent corners, images of pigeons and fountains flicker faintly, and the hollow shuffling and shushing in the gilded halls of kings echo, where the austere and grand stare down from the canopies above. Etched deeper are the emotions: the mystery and awe among the shadowy tombs and effigies of the ancient; and the learned excitement of meeting a soufflé. To this day, I wonder whether I would have been as impressed without adult cues. And the smells: coffee and cigarettes in the morning, mixed with butter and diesel. The quartet still greets and transports me to those cradle years every time I step out into the streets of Europe. There are few cities with which I have had as long of an affair as Paris. In the nearly four decades since my very first trip, I have lost count of the number of times I’ve visited. 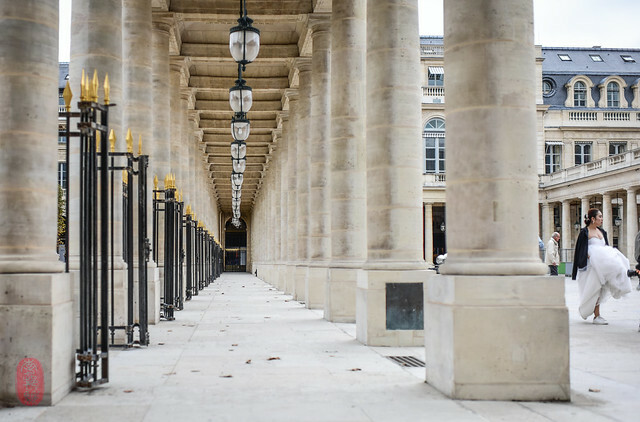 If that frequency has taught me anything, it’s that Paris’s offerings are manifold: history, architecture, fashion, art, grandeur, and romance. And in each, it is generous to the point of excess. Yet, I’ve always felt that the one thing for which Paris should be celebrated the most was lacking. 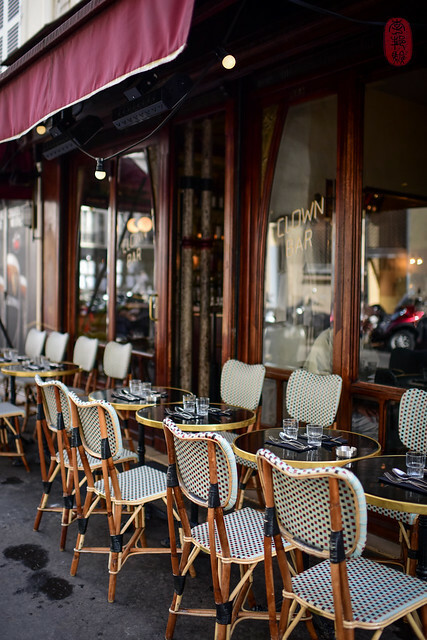 Capital to wealth, style, sophistication, and a culture that prizes good taste, Paris ought to have excellent restaurants. Not just a few. But oodles of them. Of all shapes and sizes. Quite possibly, they exist. They must. But finding them, as a foreigner, isn’t easy. Tourists are herded by concierges and media alike to the same, over-inflated places. Indeed. Those are the reasons I return, and return again to Paris. It has been two years since I last wrote about France. And in that time, I’ve been to Paris thrice without recording much of it here. There have been short mentions of dishes and desserts I’ve liked. 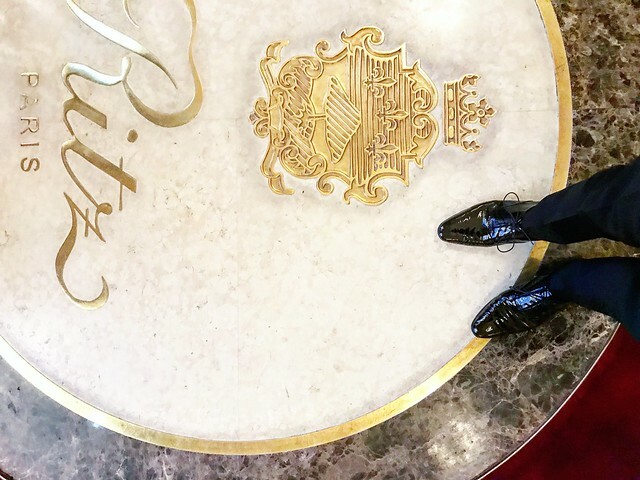 And more recently, I put down some thoughts about my sad history at le Cinq at the Four Seasons. But the bulk of my recent experiences in Paris have gone untold. In part, I didn’t feel like there was much to tell. 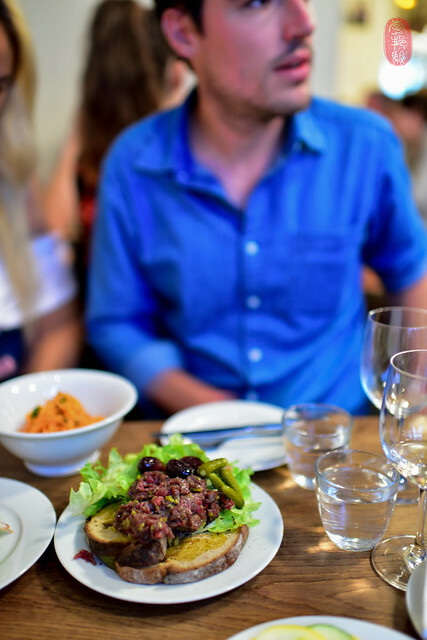 Dinner at Buvette Gastrothèque (9eme) is a good example. 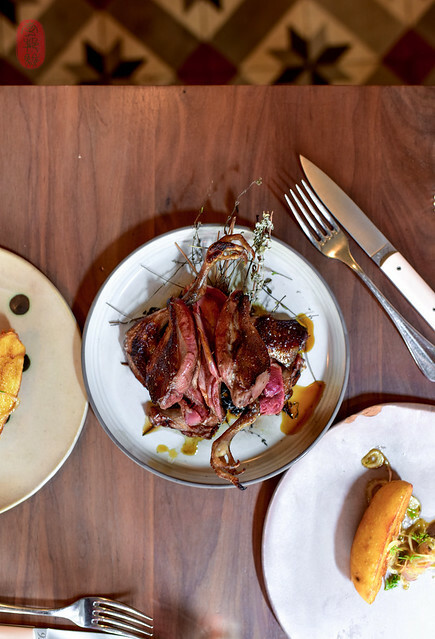 It’s what anyone should expect of it, especially if you’ve been to its sister restaurant of the same name in the West Village (in New York City). It’s cramped, crowded, and convivial in all the right ways, and delicious enough; a decent neighborhood restaurant in an area where I wouldn’t otherwise look for good food. Desnoyez, out in Belleville (20eme), serves a similar purpose. 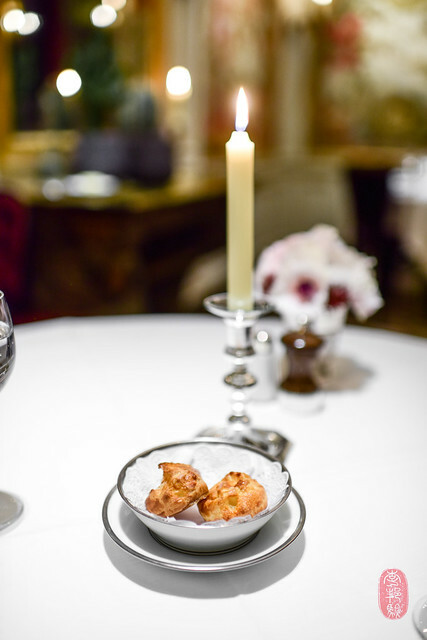 It’s a terrific escape with a friend or two, especially as a pinch-hitter on a Monday night, when dining options in Paris dwindle. 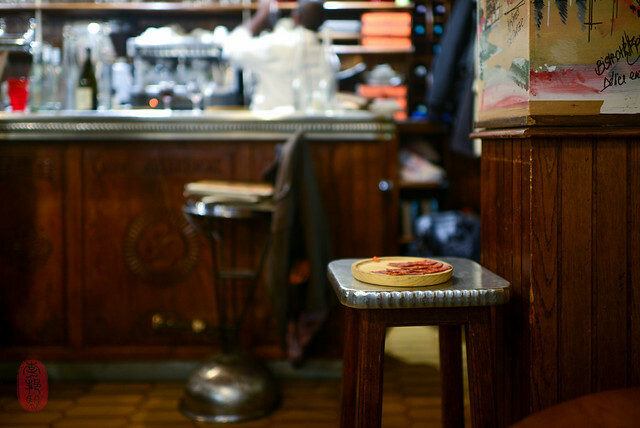 Like Buvette, the food is nicely cooked, and the space is tight and cozy. But otherwise, it was, all things considered, rather unremarkable. And that’s how I would describe many of the bistros I’ve visited, like the beloved Bistrot Paul Bert in the 11eme, and the grungier la Verre Volé in the 10eme: unremarkable. I don’t mean that as an insult. 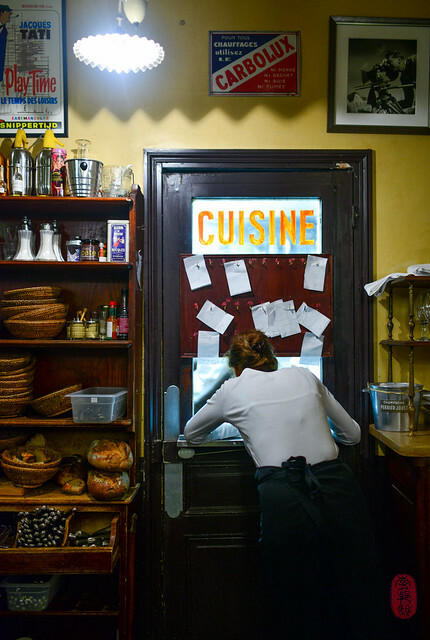 Rather, simply put, the food is good enough – especially when framed in the context of their neighborhoods. But it’s hard to justify trekking across Paris for them, not to mention from abroad. Of these two, I preferred the food at Paul Bert, where you’ll find proper bistro classics, like oeufs en meurette and steak frites, delivered hot and good. I liked the atmosphere there far better too, a rambling space full of character and characters (the staff, especially). 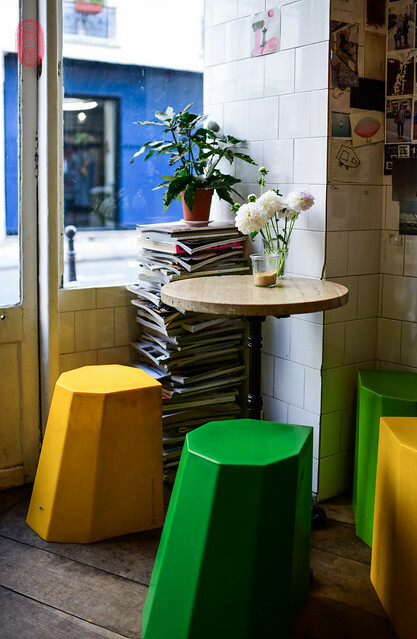 La Verre Volé, on the other hand, is charming for completely different reasons; a nook for bohemians and their wines. Admittedly, I was enticed to Grandcœur for some wrong reasons. I have a weak spot for pretty places. And Grandcœur looked pretty. Indeed, it is pretty; a beautifully restored carriage house hidden in a quiet courtyard in the Marais. The patio seating isn’t quite as charming as it looks on the website, but the interior of the restaurant, with its rough-hewn stone rising high into a ceiling of exposed wooden beams, is quite fetching. In my defense, I was ultimately swayed to this new restaurant because it’s run by Mauro Colegreco, the two Michelin-starred chef of Mirazur in Menton, France, where I had two lovely meals in 2011. And the chef he installed to run the day-to-day operations – Rafael Gomes – also has some decent kitchen pedigree, which seemed encouraging. Our meal wasn’t terrible. But it was far from great, especially considering the prices. 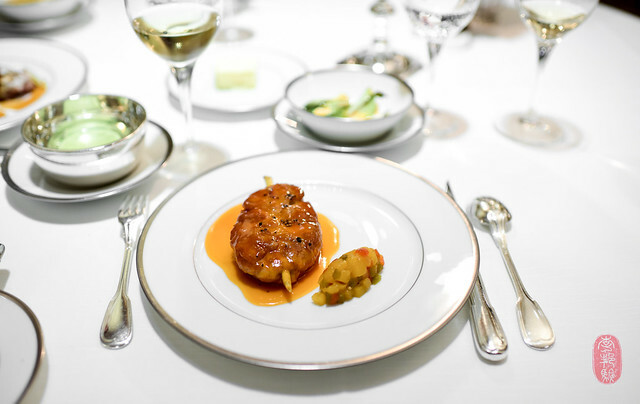 That being said, the pintade (guinea fowl) I had here was the nadir of my latest trip to Paris. It came out brown and dry; it looked as if it had sat under a heat lamp for a few too many. I was similarly unmoved by le Comptoir du Relais, Yves Cambeborde’s bistro near the Odéon in the 6eme. On a sunny afternoon last August – the month when Parisians decamp to the countryside, leaving the city half-shuttered and blissfully quiet – my friend and I found an empty two-top on the sidewalk as we strolled by. We decided to stay for a late lunch. Most of what we had was good. But it certainly didn’t inspire trans-Atlantic signals (not that it needed to). But given all the fanfare the restaurant has received in the 12 years since it opened – especially among American chefs – perhaps I was expecting too much. While I appreciate Camdeborde’s significance in the Parisian “bistronomie” movement, I also know that we’re a full decade (or two) on from that revolution. And, as I’ve written on this blog before, context is everything. Do I have any good news to report? I’ve mentioned The Clown Bar before, as have many others (it’s next to the Cirque d’Hiver in the 11eme). But a recent lunch there prompts me to remind anew: go. Not just for the dreamy tiles, the stained glass ceiling, or the curved zinc bar top – all of which date back a century or more – but for the cooking. Out of a kitchen the size of a phone booth, chef Sota Atsumi is sending out some of the most soulful food I’ve had in Paris. A recent return to Chez l’Ami Jean also warrants a mention. In the two years since my last dinner at this lively bistro on a quiet street in the 7eme, chef Stéphane Jégo has renovated his kitchen. He seems to have enlarged it, and made it a more accessible from the dining room. Those of you who have been in the past might remember the window out of which he used to yell orders and pass dishes to servers. Now, servers can walk into the kitchen more easily to pick-up and return dishes – although that hasn’t resolved the yelling. Jégo has tweaked his menu too. Gone are the family-size portions. For example, the terrine of pâté no longer comes whole to your table, but rather, by the slice. And his famous “riz ‘o lait” is now served individually, with all of the ingredients portioned per diner, instead of presenting the rice pudding and all of its accompaniments for the table to share. Don’t be misled – his food is still hearty, and portions are still generous. But I felt less smothered this time, and less wasteful. The dining room remains largely unchanged, as does the service – a unique brand of cheeky that’s pitched perfectly for the tourists who crowd the place. I don’t mind it. I certainly prefer it to the brusque, if not frosty reception I’ve come to expect elsewhere. I love morning time in Paris. And, in recent years, I’ve found more and more places where I like starting my day in the city. Of course, there’s Télescope, a tiny coffee shop near the Palais-Royale (1er); and Fragments near Chemin Vert in the 3eme. But there’s also Boot Café, perhaps my favorite of the three (it’s also in the 3eme). As its name might suggest, it’s the size of a shoebox, and seats no more than half a dozen, if everyone agrees to share and squeeze. 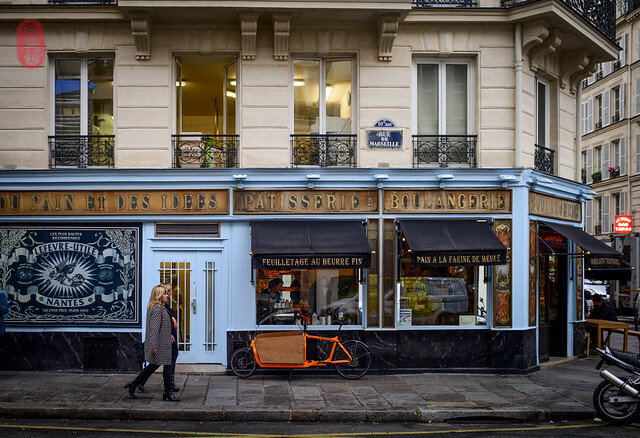 New Yorker Phil Euell opened this coffee shop in 2014, and designed it too, keeping the blue façade that he inherited from the cordonniere (shoe repair) that used to occupy the space. The coffee is great, and so are the pastries, including a daringly dark scone served with crème fraîche and jam. My friend Hermon took me to La Fontaine de Belleville one morning for coffee (10eme). 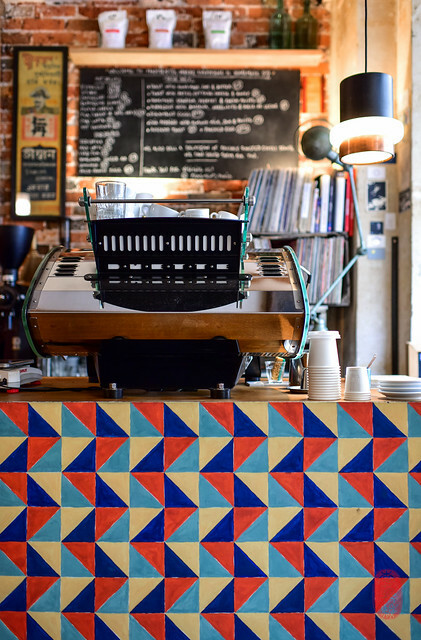 It’s owned and operated by the guys of Belleville Brûlerie, a coffee roasting company located in the neighborhood of the same name. I know Hermon from Kansas City. He’s a jazz musician who recently moved to Paris. You’ll find him playing his trumpet at La Fontaine de Belleville from time to time. We lingered until lunch, when Hermon convinced me to order the jambon-beurre. I’ve never been much of a jambon-beurre kind of guy – ham and butter, together, gets a bit cloying for me. To make matters worse, my mother loved them so much that she channeled a far less appealing version into my lunchbox when I was a kid – American deli ham with copious butter on white bread. No thanks. But the jambon-beurre at La Fontaine de Belleville is fantastic. It’s the black pepper – they’ve mixed a fair amount of it into the butter. And it makes all the difference. I liked this version so much that I returned for it the next day. Like The Clown Bar, La Fontaine de Belleville is a Parisian postcard: tiles, brass trim, stenciled glass, and giant mirrors to magnify all of it. 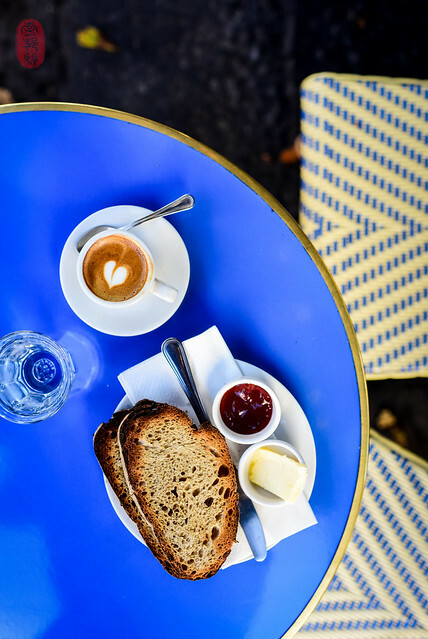 Outside, wicker chairs line the sidewalk beneath an awning, where I had a noisette and some toast one morning under the watchful eye of a big, frowny mastiff who visited me from a nearby table. He rested his giant head on my knee and watched me eat. His owners winked and smiled from across the way, content to let their kid charm and shame his way down the row. A gilded time capsule from the Belle Époque sits quietly on the corner of rue Yves Toudic and rue de Marseille, just downhill and across the canal from La Fontaine de Belleville (you’re still in the 10eme). Marked “boulangerie fine,” this is Christophe Vasseur’s du Pain et des Idées, celebrated for its flakey croissants and pastries. The bakery is tiny. There’s only enough room inside for a handful of customers to stand at the counter mounded with baked goods. A line trails out the front door, and often into the street. But it moves quickly. The locals generally get their breads to go. Only the tourists huddle together on the benches at the two small tables outside. Go early, and go often. This place is great. One night, my friend Andreas and I cleaned ourselves up, put on our dinner jackets, and headed to The Ritz. I had never been. And a recent, 4-year, gazillion-dollar remodel begged a visit. Far back, in a remote corner of the hotel, beyond the yards of rugs and reams of velveteen that line its corridors, is The Bar Hemingway. Once the haunt and repair of legends, including its namesake – the author Ernest Hemingway – this wood-paneled closet is now a perch for the well-dressed and gawkers alike. Tourist trap or Parisian relic? It’s quite possibly both, depending on who you ask, and where you sit. We were given two seats in front of head bartender and master of ceremony Colin Peter Field (who has his own Wikipedia page, by the way). He’s a bon vivant and showman from a different era. He might give you a menu. But it’s useless, because, as soon as one appears, he bombards you with a rambling and disorienting run-on of charm that arrests your ability to read or think. His aim is to sell you one of his famous $30 dry martinis. And so confident is he in his success that, even before you agree, your drink is being shaken in the back, behind a curtain, out of which dozens of martinis seemed to fly by the minute. Field’s show is nonstop, and he indiscriminately regales his half-dozen captives at the bar with stories and antics from start to finish. He’ll tell you about the history of a drink (most likely one he created), or some legendary place he has worked, all while muddling what seems like an entire patch of basil and mint into a non-alcoholic ginger beer, for which he’ll also charge $30. He’ll try to sell you on their hot dogs too. It’s entertaining, if not also exhausting. From the wide and stately Vendôme, we escaped to the venerable Vosges. For some time, especially in earlier years, l’Ambroisie seemed shrouded in mystery to foreigners. Certainly, any restaurant that charges upwards of $200 per plate exists in rarified air, far beyond the reach of most. (Owing to a splurge of white truffles, my first meal here in 2008 remains, to date, the most expensive meal I’ve ever had.) 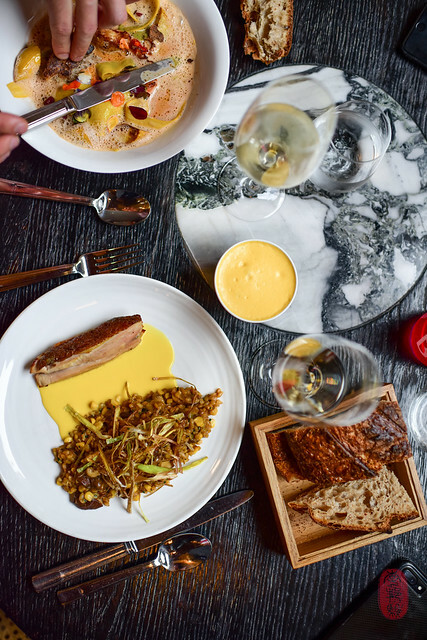 Adding to l’Ambroisie’s inaccessibility, was a particularly challenging route to reservations. The website, if I recall correctly, was simply a homepage with no links – just a telephone number. Phones weren’t consistently answered, and messages weren’t always returned. And, the inability (or, more likely, unwillingness) among staff members to speak English, coupled with their stone-faced stiffness, were perceived as deterrents to foreign clientele. But things seemed to have changed on this last trip. The restaurant now has a working website. The phones were answered promptly the few times I called. And the servers – most of whom I remember from nearly a decade ago – were eager to conduct service in English, and were far friendlier (at times, venturing into camp). These accommodations have only improved the experience, in my opinion. And, l’Ambroisie has lost neither class nor dignity in them. A decade on, Pacaud still offers one of the finest tables I have ever had the pleasure of attending. 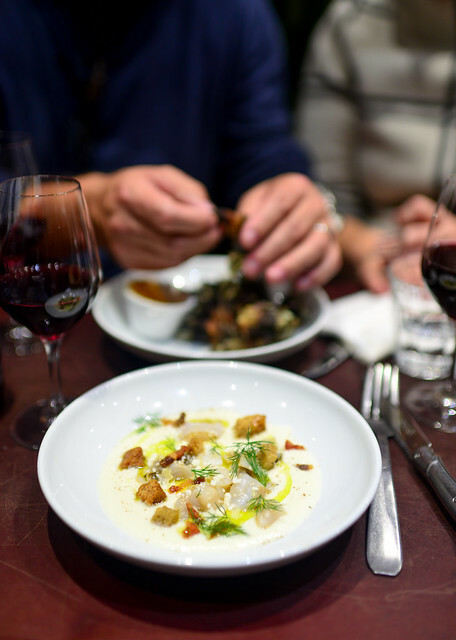 There is no tasting menu at l’Ambroisie. Blissfully, there are only a dozen plates on the menu, divided equally into three sections: first courses, fish, and meat. 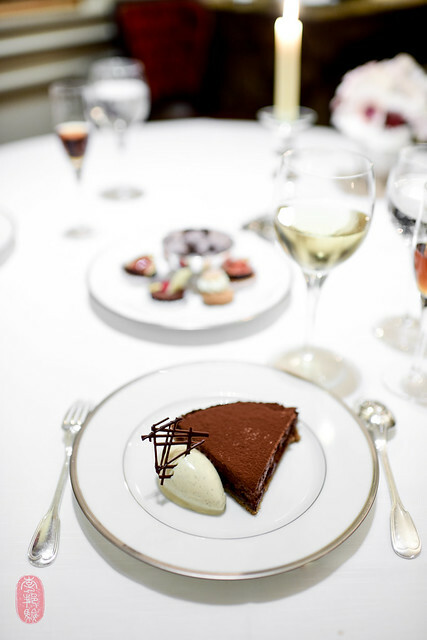 Following, there’s an option for cheese, and a very short list of desserts, which the waiters will usually list for you (and nudge you, correctly, towards Pacaud’s bitter chocolate tarte). 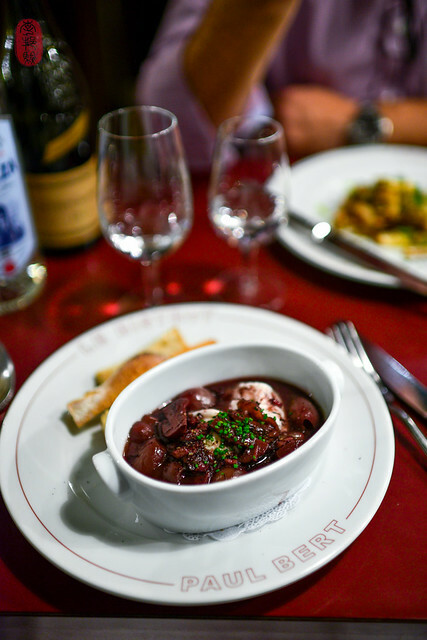 We also had a couple of the restaurant’s more classically French dishes. 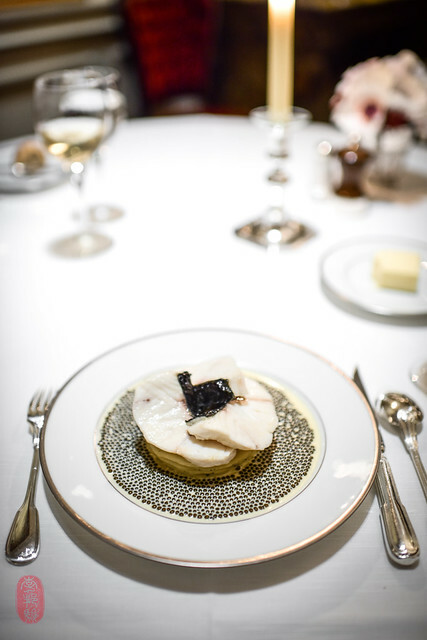 Andreas had never had Pacaud’s famous sea bass: three fillets in cross-cut arranged in a rosette pattern, served with thinly sliced artichoke hearts, all of it ringed with caviar the size of ball bearings. So we ordered it. It’s still as spectacular as I remember it. 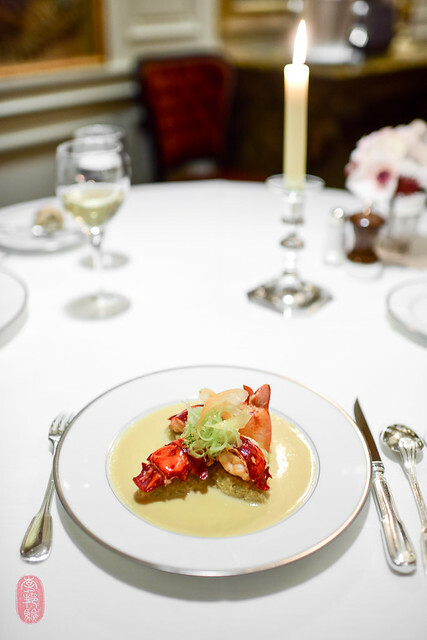 We also had lobster, served with nage lightly perfumed with anise. And to pair with all, a fine bottle of white Burgundy. The restaurant has been described a temple; an apt conceit for the “food of gods” it purports to serve. It’s a sacristy richly dressed, lined in tapestries and marble, with silver-rimmed porcelain, the glow of ivory tapers, and, that night, a blush of pink poppies on every table. Refinement and propriety will find few, better stewards than l’Ambroisie, cloistered and quiet in Paris. 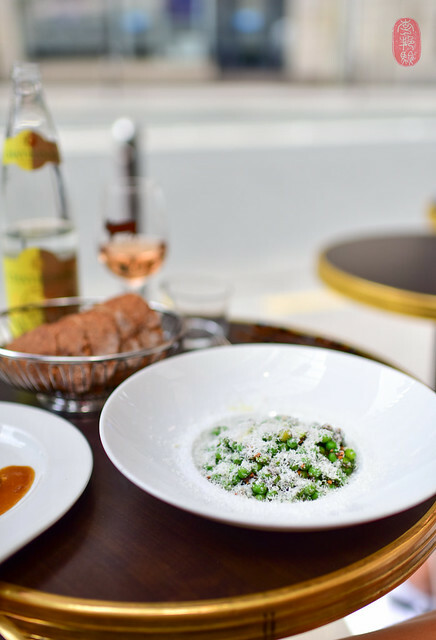 There are other favorites in Paris, which I have written about on this blog before – like the warm, chicken salad pita at Miznon; the ice cream at la Maison Berthillon; the pastries at Jacques Genin; and the rose sugar-coated praline briôche at Pralus. But like Bertrand Grébaut’s Septime in the 11eme; le Dauphin, Iñaki Aizpitarte’s wine bar (also in the 11eme); Sven Chartier’s Saturne in the 2eme near the Bourse; or Raquel Carena’s le Baratin out in Belleville, they’re all fairly well-covered by the press. 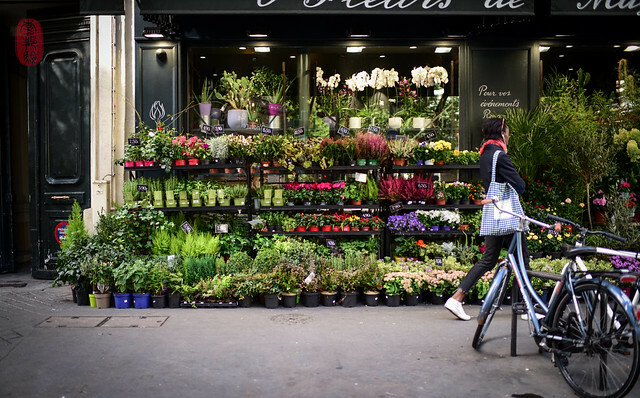 Despite my early indifference to the city (and my disgust in its increasing griminess, a complaint that I publicly file here), there are reasons why Paris has been my most-frequent destination abroad. But those reasons have never included food. I’ll admit, it has taken me some time to embrace Paris enough to peel back the suffocating coat of tourism that obscures what delicious treasures might be glittering beneath. But, lately, I’ve been finding it a more compelling place to eat than before. Whether it’s my recent willingness to explore the city more, or whether the local dining scene is improving, I cannot say. It might be both. Either way, my recent trips to Paris have been wonderful reminders of why I choose to return, year after year. Not the least of which are the many faces and places there that have grown familiar over the years, whether by habit or serendipity. 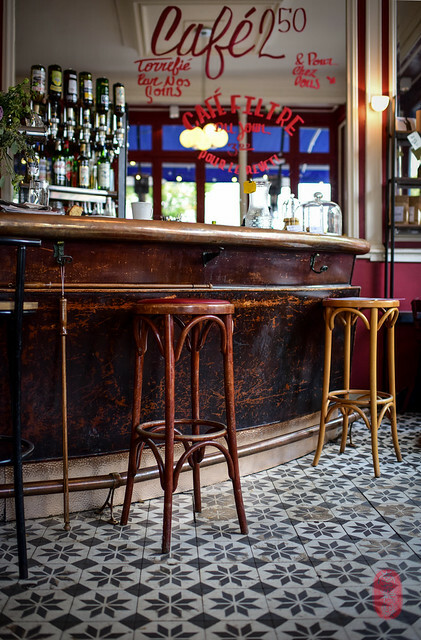 Paris never ceases to amaze me with with chance meetings, as it did this last time at a coffee shop, when I found an American friend sitting alone with his morning cup; and again at dinner one night, when I unexpectedly spied a friend from Norway having a pre-dinner drink. And, as if my latest trip needed a bow to tie it all together perfectly, my college roommate happened to be getting married in Paris while I was there. So I spent my last night in the city with him, his wife, and his family at their beautiful family home, where I have spent many nights over the decades; a long overdue reunion. These wonderful meetings are not only reminders of just how small the world can be, but a testament to the universal appeal of Paris as an important intersection of life, especially mine. This old city is magical. Super powers, force fields, or not, it manages to show beautiful at any time, all the time. And I am truly lucky to have been able to experience it as much as I have. May it be ever faithful, but never routine. * The pigeon breasts were glazed in what appeared to be a simple, confectioner’s sugar icing, not unlike the kind you’d use to glaze a bundt cake. I’ll admit, it was odd, and it threw us off at first. 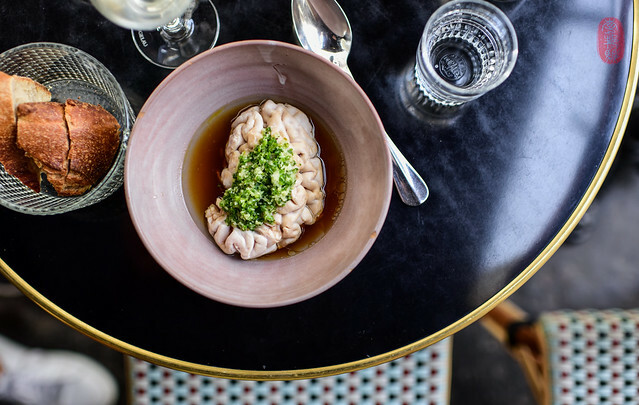 Photos: Silky calf brains at The Clown Bar; a bride walks through the Palais-Royale; beef tartare at Buvette Gastrothèque and the order window at Bistrot Paul Bert; oeufs en meurette at Bistrot Paul Bert, raw fish at la Verre Volé; a bowl of peas on the sidewalk at le Comptoir du Relais, pintade (guinea fowl) at Grandcœur; two photos from The Clown Bar, including sidewalk seating and a plate of roasted pigeon; sliced charcuterie sitting out for diners to snack on while waiting for table at Chez l’Ami Jean; the mosaic pattern on the espresso counter at Fragments, the colorful chairs inside Boot Café; two photos from la Fontaine de Belleville including stools at the bar and a tartine breakfast; a street scene – du Pain et des Idées; The Ritz Paris; gougères and the lobster anise dish at l’Ambroisie; lemongrass-glazed sweetbreads at l’Ambroisie; sea bass with caviar and the bitter dark chocolate tarte at l’Ambroisie; the leaves turn at the Palais-Royale. ~ by ulterior epicure on November 11, 2017.